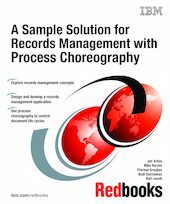 This IBM Redbooks publication describes a sample implementation of a complex solution that addresses a key challenge being faced by many enterprises today. Document and record management has always been a difficult (and often manual) process. Enterprises need to address this challenge, not only to make their business, employees, partners, and customers more efficient, but also to comply with ever-increasing regulations. Addressing these requirements demands a flexible solution that can be integrated with current and future IT systems and applications. It is also critical that it is driven through controllable and automated business processes. This book describes a sample solution that integrates IBM DB2 Records Manager, IBM DB2 Content Manager, IBM WebSphere Application Server Enterprise Process Choreographer, IBM WebSphere Portal, IBM Tivoli Directory Server, and other software to provide a prototype solution. Though basic in its function, the solution and the steps to implement it can be used to help architects, IT specialists, and developers get started in creating a solution addressing their enterprise-specific requirements.